Rina is the Mermaid Princess of the North Atlantic Ocean, and keeper of the Green Pearl. She is the third Mermaid to appear in the series. She is part of the main trio with Lucia and Hanon, and so she is present throughout the series. Initially she is depicted as beautiful but stern and bent on revenge for the capture of her best friend, Noel. Later, however, she evolves into a more mature character, and acts as an older sister figure to Lucia and Hanon. She seems to love plasma TVs and shows this love in many anime episodes. She also seems to love watching comedy shows. When her kingdom was attacked by Gaito, Rina had escaped with another Mermaid Princess, Noel. The two were in search of the other Mermaids, but Gaito and Yuuri appeared. Their attack was meant to hit both, but Noel took the attacks in order to save Rina. Since then, Rina went to the human world to avenge Noel by finding Gaito. Rina then transferred to the same school Lucia and Hanon went to, only she chose to wear the male school uniform. At first, she seemed to hate Kaito, because he looked just like Gaito, but she didn't know that. She was found out by Lucia and Hanon, and now the three became friends. Rina has no love interest in the first season, but in Pure, she meets Hamasaki Masahiro. The two end up falling in love. 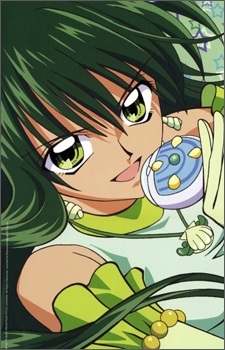 Rina has three different forms, Mermaid Rina, Touin Rina (her human form), and her idol form, Green Pearl Voice. Her two image songs are Star Jewel and Piece of Love.